Researchers began their investigation with 976 chemicals identified by EPA’s ToxCast program, an inventory of compounds that have undergone screening for a battery of laboratory tests. Within that inventory, 75 chemicals, including linuron, were found to interfere with the signaling pathways linked to MS.
To confirm the adverse impacts, scientists used the embryos of zebrafish, animals often used as models in laboratory research. The zebrafish embryos were altered to contain low levels of myelin, a protein that protects nerve cells, as is similar in patients that have MS. The embyros were also engineered to produce a green fluorescent protein when damaged. The zebrafish model revealed five compounds that increased inflammation in the central nervous system. These chemicals were then tested on mouse astrocytes, star shaped cells that occur in the brain and spinal cord and perform many functions, including the provision of nutrients to nervous tissue and repairing the brain after traumatic injury. Both the herbicide linuron and another chemical, methyl carbamate, used in textiles, polymers, and pharmaceuticals, caused inflammation in mouse astrocytes. Scientists indicate their results were limited by number of chemicals within the ToxCast program, and a wider availability of chemicals for lab testing would likely yield additional candidates that cause inflammation in the central nervous system. “When we study inflammation and neurodegeneration, we learn that the environment may play just as important of a role as genetics,” Dr. Quintana noted. Evidence is increasingly showing that the probable carcinogen glyphosate is merely the posterchild for a litany of other toxic herbicides that can wreak havoc on human health. The herbicide paraquat has long been associated with the onset of Parkinson’s disease. Atrazine, another broadleaf herbicide, has been linked to a range of diseases, including birth defects, cancer, impaired neurodevelopment, and reproductive disorders. While these herbicides are EPA-registered and used widely in the U.S., France has banned glyphosate use, and the entire EU has banned atrazine, paraquat, and the topic of the current study, linuron, due to human health concerns. Read up on the range of all too common diseases linked to pesticide exposure in Beyond Pesticides’ Pesticide Induced Diseases Database. And for information on avoiding the hazardous herbicides and pesticides on conventional food found in the grocery store, see the Eating with a Conscience database. 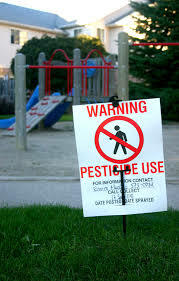 This entry was posted on Tuesday, February 5th, 2019 at 12:00 am	and is filed under Environmental Protection Agency (EPA), Lawns/Landscapes, Linuron, Multiple Sclerosis (MS), Pesticide Regulation, Uncategorized. You can follow any responses to this entry through the RSS 2.0 feed. You can skip to the end and leave a response. Pinging is currently not allowed.